Fascination with birds is something I will admit to, although I am not a bird watcher except in the most casual sense. Anyone with a window and a bit of cash for birdseed can enjoy the various personalities of British garden birds. In my experience, the expenditure is well worth it. I stand at the sink watching the bird table and all its various patrons, well entertained. Recently, I have had cause to read The Darkling Thrush by Thomas Hardy in depth. Written at the very close of the 19th century, near the last day of the year, it has made me think about the cultural role of birds, their symbolic weight, their roles as messengers and common, but unpredictable, omens. I suspect we would be hard pressed to name more than four birds that are symbolic in today’s society. Perhaps we would mention the dove (peace), the robin (christmas), the eagle (authority) and the magpie (luck or the lack of it). The hunting of the wren, which used to occur across the British Isles on the 26th December, has died out, and with it the understanding of this bird’s importance within Celtic mythology. 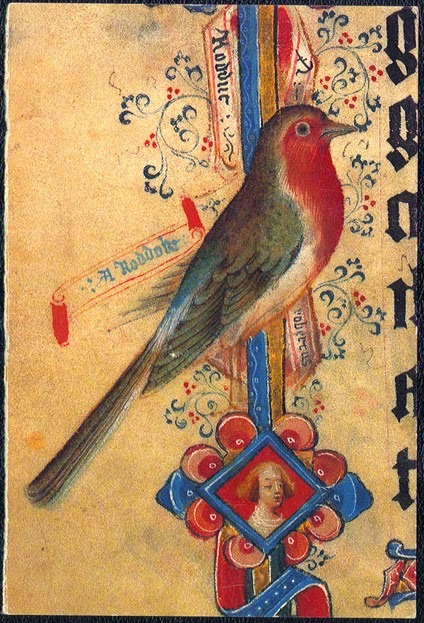 Medieval manuscript artists could call upon many more birds to lend meaning and beauty to their work. Various species were explained in Bestiaries, which made connections between the appearance and habits of animals and their spiritual significance. The audience for these books had been taught that God endowed all creation with lessons for the faithful to discover. One such was that the raven hatched white chicks and refused to feed them until they developed dark feathers, so miraculously God fed them in the intervening time, showing his providence. 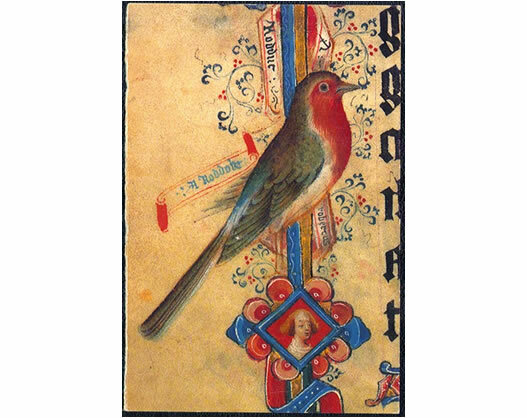 Another was that the robin was present at the time of the crucifixion of Jesus, flying near him and singing to comfort him, and that it was Christ’s blood that gave the robin his red breast, showing his sacrifice. Very often birds appear in the margins of Medieval holy books, where they may be symbols, but are also stunning natural representations of the birds seen by all who lived in Medieval Britain. I like to think that the artists at that time recognised the birds as entities with their own importance, not simply as automata set on earth to teach humankind. The robins that stare intently through the glass of my window in the first bare light of dawn and follow my progress along the hedgerow must have delighted the artists of the past, much as they do me, with their character and idiosyncrasies. But, as humans, we look for meaning in all things, whether it is territorial behaviour, sexual selection or the munificence of God. And how much less interesting life would be if we didn’t. black ice eye aimed at me. Chest swollen with downy air. I once heard his voice in a small room. coloured glass, a falling stream.